Class Time, Simulation Clinic and Clinic: You will participate in formal instruction in a variety of settings: the classroom, simulation clinic, on-campus clinic, and community-based settings. Faculty use a variety of educational methodologies, including traditional lecture, seminars, case-based and problem-based learning, on-line modules, laboratory, clinical simulation, standardized patient exercises, direct patient care, and service learning. Studying and Clinical Skill Development: You will study and practice clinical skills outside of formal class time. You will have 24-hour access to virtually all instructional material presented by faculty online and through Realizeit virtual learning platform and Vital Source Dental Library. The Simulation Clinic in the Health Education Center will be open to you on selected evenings for clinical skill development. Class Time: During the D3 and D4 year, you will participate in advanced integrated clinical seminars and have the opportunity to pursue clinical research. Clinical Rotations and Comprehensive Care Clinic: Starting in your first Summer term, you will spend time in direct patient care, both on campus at the WesternU Patient Care Center and in the Community-Based Clinic network. 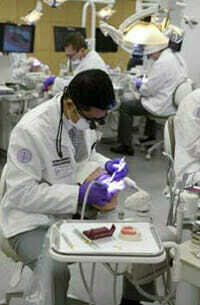 You will provide a broad range of general dental treatment in your Comprehensive Care group of faculty and students. Studying, Clinical Skill Development, and Clinical Preparation: During the D3 and D4 year, you can expect to spend at least 10 hours each week outside of scheduled clinic and didactic classes. This time includes individual and directed group study, advanced clinical skill development, and supporting direct patient care. Community Service: As a WesternU dental student, you will participate in extensive community-based clinical care experiences. You will work in clinical sites such as Federally Qualified Health Centers (FQHCs), community health centers, hospital-based clinics, and private dental practices. Most of these sites will be in the Southern California, In addition to our formal service-learning program, you can also hone skills through the numerous study clubs and student organizations on campus.